Posted in Brunch, IP, pressure cooker, on February 12th, 2018. Goodness, me. This was so easy to make. I could even make this for myself for dinner, and then have leftovers. Christmas morning I usually make something special for breakfast. My cousin Gary was visiting, and although he wasn’t feeling very good, still he knew he should eat, so I whipped this up in the IP. It was my first IP recipe I tried, and it turned out really well. My cousin has to eat GF, so going crustless was the way to go anyway. I was perfectly happy with the results. I did research using the IP for quiche, but found several recipes, so I knew it was a successful thing to try. I had some baby spinach in the refrigerator that needed eating anyway, so I kind of combined two recipes and made it a quiche Lorraine style but with added spinach. Daughter Sara gave me an IP cookbook called Instant Pot® Obsession: The Ultimate Electric Pressure Cooker Cookbook for Cooking Everything Fast . This recipe, with my modifications, came from that book. The quiche ingredients were standard, starting with some thick sliced bacon that I sautéed for awhile to get it rendered out and crispy. There was hardly any fat in the pan anyway since the bacon I used was so meaty. The onion was cooked through, then I cooled and cleaned the IP pot. 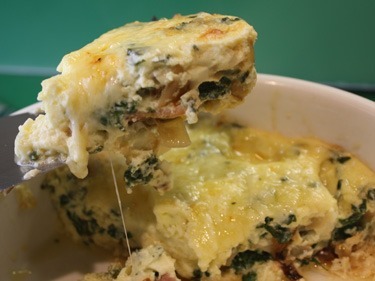 Meanwhile I mixed up the quiche ingredients (eggs, milk, cream, S & P, Emmental cheese, spinach) and the bacon and onion, of course. The rack is inserted into the IP, then the quiche, loosely covered with foil (you don’t want steam to get in there – it would ruin the chemistry of the quiche). It was pressure cooked for 10 minutes, rested for 10, then quick released. I’d shredded a bit of extra Emmental and sprinkled more of it on top and stuck it under the oven broiler, just so it would have a bit of color. One thing about pressure cooking . . . you can’t get good color unless you brown things before, or broil them after. It took no time at all to broil it for a few minutes. I let it rest for a couple of minutes because it was so hot, then cut into 4 portions and served it along with some yogurt and fruit. What’s GOOD: it was basically a 2-dish prep (IP pot plus the ceramic baking dish) so there was easy cleanup. Loved the quiche. It may not have had the same consistency as a traditional oven-baked quiche – almost like eggs done in the microwave – but it was good and hit the spot. I liked the addition of spinach, even though it’s not traditional for a Lorraine type quiche. What’s NOT: nothing really, unless you really miss the crust. 1. Prepare a 1-quart round baking dish (that fits in the IP) and coat the bottom and sides with the room temp butter. 2. Using the IP saute function render the bacon until it’s crispy. Remove and set aside. Add onion and 1/4 tsp salt and cook, stirring often, until the onion is fully translucent and soft. Remove and set aside. Pour out any extra grease from the pot, cool, then clean the pot and replace into the IP. 3. In a large bowl combine the eggs, milk and cream, then add pepper and remaining salt. Add half the cheese to the mixture along with the spinach, bacon and onion, and pour it all into the prepared, buttered baking dish. Add remaining cheese on top. Cover with foil – not tight – but enough so steam won’t get into the dish. Install rack in the pot and gently place quiche dish on top of the rack. Add water to the bottom. Use manual pressure for 10 minutes, then let sit for 10 minutes as a natural release, then quick release. 4. Open IP, remove quiche, using the rack handles and set on countertop. Meanwhile, preheat broiler. 5. Add extra cheese to the top of the quiche and place under broiler just long enough to get some nice golden brown color to the top (watch carefully), remove, allow to cool for about 3-5 minutes. Cut in wedges and serve. Per Serving: 386 Calories; 31g Fat (71.9% calories from fat); 20g Protein; 7g Carbohydrate; 1g Dietary Fiber; 250mg Cholesterol; 519mg Sodium. Posted in IP, Pork, pressure cooker, on February 8th, 2018. Oh yes, mouth watering happening as I look at that photo. So quick and easy. The other day I discovered an ancient package of pork spare ribs (not baby backs) in my freezer, back when my DH and I bought a part of a Berkshire pig. It had unique wrapping, so I knew – and it had a date on it. 2011. Wow. It’s been in my freezer for nearly 8 years! I didn’t hold out much hope that it would be all that good, but guess what? It was wonderful. Maybe because it was packaged well to begin with! With my new instant pot sitting on my kitchen counter, I scanned websites to find a recipe that would work. Sure enough, found one at the blog called iwashyoudry. Shawna had used baby backs, but I presumed the cooking time would be similar. First I removed the thin tissue along the back of the ribs. It’s a bit of a nuisance to have to do that, but I did it anyway, knowing the dry rub would reach all the inner meat if I took the time. Then I combined the dry rub – a little bit of brown sugar and a bunch of spices. A very good mixture, I think! Into the IP they went, to rest on top of the IP rack, leaning up against the sides of the pot. Once the meat was in, you add some water, apple cider vinegar AND a tiny jot of liquid smoke to the bottom of the pot, making sure you don’t wash off any of the spices sticking to the ribs. Having used liquid smoke in the past I wasn’t altogether sure I’d like it – but using just 1/4 tsp gave the ribs just a hint of smoke. The meat cooked under high pressure for 23 minutes (Shawna cooked her for 25, but spareribs have less meat on them, so I chose 23). It rested for 10 minutes, then quick release. Meanwhile, preheat the broiler during the last couple minutes of resting time and prepare a baking sheet with foil (for easy cleanup) and have at the ready your favorite bottled BBQ sauce. Lay them on the baking sheet and brush that on. Broil just until beginning to get crispy brown. Remove and dig in! For mine, the ribs were nearly falling off of the meat, so I just took the bones out and had a nice little plate of just meat. And sauce. And spices. All good tasty stuff! 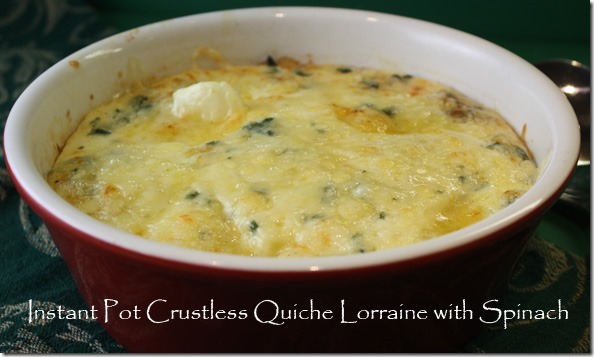 My thanks to Shawna for a great recipe that works! What’s GOOD: you can have ribs on the table in a little over 35 minutes or so, that taste like you’ve spent hours smoking and tending to them. When you haven’t!! Loved the combo of spices in the dry rub and with using just a little bit of BBQ sauce to finish them off; these were perfect! A keeper. What’s NOT: really nothing, other than ribs have a lot of fat, so for me, they’re a real treat. Not something I’d fix on a regular basis. 2. Combine the brown sugar, chili powder, parsley, salt, pepper, cumin, garlic powder, onion powder and cayenne pepper in a small dish and rub all over the ribs. 3. Place the rack in your IP/pressure cooker and place the ribs inside the pot, standing on their ends, wrapping around the inside of the pot. It’s okay if it leans against the pan. Pour in the water, apple cider and liquid smoke (if using), being careful to not wash off any of the seasonings. 4. Secure the lid, making sure the vent is closed. Pressure cook on high for 23 minutes. Let the pressure naturally release for 10 minutes, then quick release the rest of the way. 5. Carefully remove the ribs from the pressure cooker and set on a foil lined baking sheet. Brush with your favorite BBQ sauce, and broil for 5 minutes, but keep an eye on it so it doesn’t burn. Per Serving: 686 Calories; 51g Fat (67.4% calories from fat); 37g Protein; 18g Carbohydrate; 2g Dietary Fiber; 165mg Cholesterol; 994mg Sodium. Posted in Pork, pressure cooker, on June 4th, 2013. Another one of those “brown” photos. It’s so very hard to give brown colored food any eye appeal. All I can tell you is that this dish was absolutely sensational. The flavors – oh my goodness yes. I’ll be making this again and again. It would even be good enough for guests. What you see there is browned pork chunks (at top), sweet potatoes (bottom and far right), an organic purple carrot (right side, vertical) and fennel (left). And drizzled over the top is the lightly creamed Calvados and broth which was then topped with chopped chives. Thank goodness for chives! Out of the freezer came our last package of Berkshire pork. It was pork chunks, and by the time I got into the kitchen to start dinner, it was after 4pm, so I needed to figure out something fast. 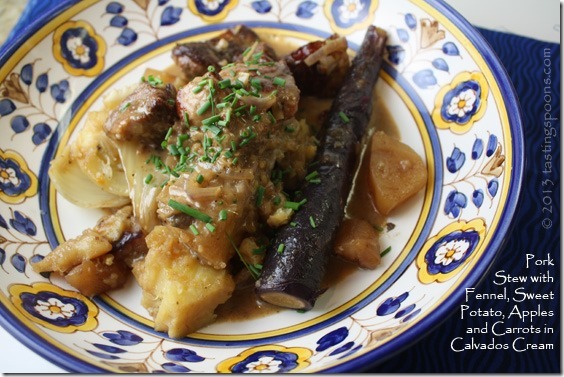 What I didn’t know was what kind of pork it was – it was labeled pork stew meat, that’s all. It could have been trimmings from pork chops, pork shoulder, tenderloin bits, or pork loin. All needing different cooking times. But oh well, I just had to guess. With time of an essence, I knew I needed to do this in the pressure cooker, so the recipe below is done that way, but you can do this all without one – just cook the meat mixture on the stove until barely cooked through, and cook the vegetables until they’re tender. You can add the Calvados cream ingredients with everything in the pot. Calvados is distilled from cider made from specially grown and selected apples, of which there are over 200 named varieties. It is not uncommon for a Calvados producer to use over 100 specific varieties of apples, which are either sweet (such as the Rouge Duret variety), tart (such as the Rambault variety), or bitter (such as the Mettais, Saint Martin, Frequin, and Binet Rouge varieties), the latter being inedible. The fruit is harvested (either by hand or mechanically) and pressed into a juice that is fermented into a dry cider. It is then distilled into eau de vie. After two years aging in oak casks, it can be sold as Calvados. The longer it is aged, the smoother the drink becomes. Usually the maturation goes on for several years. Just cook the pork low and slow until it’s tender, add the veggies and cook those until just tender and add the Calvados and cream in at the end. The pressure cooker just cut down the cooking times, that’s all. Here’s what I did: I sprinkled the pork chunks with Herbes de Provence, then browned them until they were caramelized brown on several sides, not crowding the pieces. That took 2 batches. I removed the meat and poured out the fat that had accumulated in the pan. Meat went back in, then I added a 6-ounce (can) of pineapple juice, 1 1/2 cups of water, bay leaves, fresh thyme sprigs, salt and pepper, and Penzey’s soup base (I used pork, but chicken would be fine). I pressure cooked that for about 13 minutes. Cooled it under a cold running tap, and the pork was just perfectly cooked. I removed the meat (because I didn’t want to cook the meat any further – it was perfectly cooked), then I added all the vegetables and apples and those were pressure cooked for 4 minutes. The vegetables were perfectly cooked so I removed them also. With the liquid left in the pan I added the shallot and Dijon mustard and let that simmer for a few minutes until the shallot was cooked. Then I added the cream and heated it through, then in went the Calvados. I cooked that for 2-3 minutes just so it would boil-off the alcohol. Then I added the meat back in and let that simmer for 2-3 minutes so the meat would be piping hot. The veggies stayed hot, so those were divided amongst the wide soup bowls, then I spooned the meat equally between the bowls (there won’t be lots of meat per person – 2 pounds of pork doesn’t end up being all that much, surprisingly) and poured the Calvados cream over them equally as well. Chopped chives went on top and it was ready to serve. What’s GOOD: Oh, just everything. The meat, the juices, the veggies, the apples and of course, the creamy Calvados sauce I drizzled over the top. You’ll be licking the bowl. What’s NOT: nothing whatsoever. Unless you don’t like stew. Or meat, or you’re averse to a little bit of cream. 1. Trim the pork of the bigger pieces of fat, if possible. Toss them with the dried herbs. 2. In a tall pressure cooker heat the oil and brown the pork pieces over medium heat. Don’t crowd the pan (do this in 2 batches). Remove pieces to a plate. 3. Drain and discard the fat in the pan. Add pineapple juice, water, Bay leaves, fresh thyme sprigs, soup base and seasonings. Transfer the pork pieces back into the pan. 4. Bring the pressure cooker up to pressure and simmer for 13 minutes. Place under cold water tap to reduce heat quickly. Taste the pork to see that it’s done – it should be just perfectly tender and juicy. If it’s not, continue to pressure cook for 2-3 minuites at a time until the meat is cooked through but not dry. Remove meat from the pan and set aside. 5. Add the fennel, sweet potato, apples and carrots. Bring the pressure cooker back up to pressure and cook for 4 minutes. Again, place under cold running tap to cool quickly. Remove all the vegetables to another plate and set aside. Discard thyme stems. 5. To the liquid in the pan (about a cup) add the shallot and Dijon mustard and cook over medium-high heat until the shallot is tender, about 3-4 minutes. Add heavy cream and cook for about 1 minute at a slow simmer. Add the Calvados brandy and stir in. Continue to heat until the mixture comes to a boil. Add the meat back into the pan and heat the meat slowly for about 2-3 minutes. 6. Divide the vegetables in 4 wide soup bowls. Divide the meat and Calvados cream over each serving and garnish with chopped chives. Serve immediately. Per Serving (this assumes you eat all the fat, most of which is drained off after you brown the meat): 699 Calories; 45g Fat (59.7% calories from fat); 32g Protein; 37g Carbohydrate; 7g Dietary Fiber; 148mg Cholesterol; 352mg Sodium. Posted in pressure cooker, Utensils, on March 20th, 2013. This post isn’t about a recipe. It’s just about pressure cookers, what makes them tick (ha! that’s a joke, the old-fashioned ones did kind of tick or jitter, new ones don’t). Most of this is synopsized (is that a word?) from my latest issue of Cook’s Illustrated. It was so interesting I thought I’d share it with you. If you’ve been reading my blog for any length of time you’ll already know that I particularly like to know the “why” of things. The science of cooking. I imagine this comes from the genetics I got from my dad – he was an engineer, and probably would have liked me to be one too, but I took a different path. Yet, when it comes to cooking, as I’ve gotten older (oh, excuse me, mature!) I really like knowing why things work. Like what is the maillard reaction (that’s the effect of caramelization or browning in a pan, mostly related to meat, but it could be anything that’s cooked to a high enough heat and creates a fond, that brown stuff that sticks to the pan, where all the flavor lies)? Or how/why does baking powder or soda makes things rise. Why is arborio rice different than long grain and why do they cook differently? You know, those kinds of things. But I’d remembered all these ensuing years how much time they saved sometimes. It was at a cooking class about 5-6 years ago that the instructor (Deb Buzar) made short ribs, and she did it in the pressure cooker. It wasn’t a pressure cooker class – but she’d arrived at the class at about 5pm, was somewhat short on time to prep for the class. But, she explained that she always does her barbecued short ribs in the pressure cooker – mostly because the recipe she shared (linked just above – and is still my go-to short rib recipe) was from her mother-in-law, and SHE had always made it in the pressure cooker. It was at that class I decided to buy one. Being a judicious buyer as I am, I went online and read reviews about PC’s. Mostly at amazon.com. There are all varying prices – from under $100 to nearly $300. After reading reviews, I decided to buy a Fagor, and purchased a variation of the 5-piece set (the one you see pictured at the top) – Fagor Duo Combi 5-Piece Pressure Cooker Set. 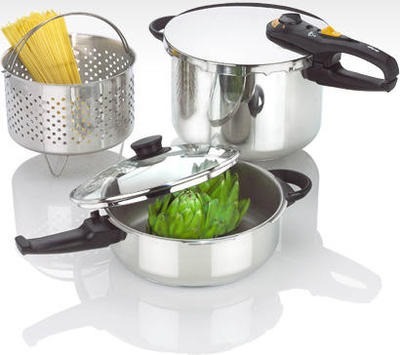 It has 2 different sized pans, with two lids – one which includes the rubber sealing ring that allows the pan to come to pressure, and the second one just an ordinary glass lid, and also came with a pasta/steamer insert. I think it’s about $150. The set I bought from amazon didn’t come with the pasta insert and didn’t have the glass lid. I’ve been nothing but happy with my purchase. I don’t use it every day. I don’t even use it every week, but when I use it – I’m very grateful I have it. Lately I’ve used it most often for cooking dried beans, which has been a revelation to me. I’m not trying to convince you to buy a Fagor. I’m only sharing my process and that I’ve been happy with my decision. So fast forward to the other day when I was reading Cook’s Illustrated, and they had a lengthy article about PCs. Purposely I didn’t flip the couple of pages to read which ones were their winners. Here’s what I learned. Pressure cookers function based on a very simple principle. In a tightly sealed pot, the boiling point of liquid is higher. As the pot heats up, pressure begins to build. This pressure makes it more difficult for water molecules to turn to vapor – therefore raising the boiling point from 212 to 250 degrees. Why does this matter? The superheated steam generated in the cooker makes food cook faster. And because the pot stays closed, cooking requires much less liquid than usual, and flavors concentrate. 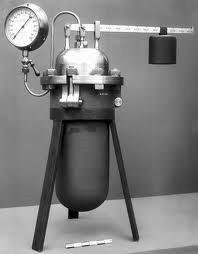 Contraptions for cooking under pressure have been around for a long, long time. They were first invented by Denis Papin in 1679. He was a French mathematician and physicist and invented it because he wanted to reduce bones (probably from cows, pigs and sheep) to bone meal. Some time in the 1900’s, after World War II, there was a big surge to develop them for the home cook. At one time I used my badly warped pressure cooker to cook chicken backs and necks (which were dirt cheap back in the 1970’s), reduce them to mush, and feed them to my female dog who had just whelped and was quite thin and weary from caring for and feeding her litter of puppies. It worked like a charm to give her lots of calcium. The bone mixture was loaded with calories too. She wolfed it down. Anyway, early pressure cookers had some inherent problems (and the article said there were some unscrupulous manufacturers too), but as the years have gone by they’ve been tested and designed for ease of use – and safety for home use. No toggle thing that ticks. With mine, I bring it up to temperature and it starts to spit steam. Once it’s a steady stream of steam, I reduce the temp, and it sits on the range with no need to watch it at all, until the minutes have ticked away. Once done, you can just let it cool down on its own. You can flip a toggle and release the steam, or I put it in my kitchen sink and run cold water over it for about 15 seconds and it’s down to a regular/no pressure. Mine has a tiny little plastic plug and when it’s under steam pressure the plug sticks up (kind of like those little plastic thingies that come in turkeys, that supposedly pop out when the turkey is done). Once pressure is released, the plastic plug slips back down into the lid so I know it’s safe to remove the lid. It’s very easy and I feel very safe using it. The article concluded that 6-quart pans aren’t very useful. Mine is an 8-quart, which was the preferred size. They also highly recommended a 9 inch width. Some are 7 1/2 inches, but they didn’t like them much. The bottom of pressure cooker pans enclose a heavy-duty aluminum ring, encased in stainless steel, that regulates and retains heat. If that ring is too small, food on the outer edges can burn. And they cautioned about using pans on a burner where the flame can lick up the sides and can damage both the locking mechanisms in the lids and the rubber gaskets. So don’t use the cooker on a really high BTU burner (those are always a wider ring of flame). Better to use a regular burner, although it will take a bit more time to bring it up to temperature. The 2 winners had base thicknesses of over 7 millimeters thick. Several other models were under 7 millimeters and didn’t perform as well. Some models didn’t quite reach/maintain the 250 degree desired temp. Only the top one did. The 2nd best, their Best Buy model (the one I own, above) didn’t quite get to 250 degrees, but was very close. All the others were less, so cooking times were longer. Some models also lost fluid (meaning they vented too much steam). The two top models lost a very tiny amount, which is ideal. 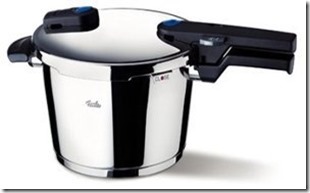 The number one model was the Fissler Vitaquick Pressure Cooker, 8.5qt . It’s $279. The #2 choice was the one I own (see link in top paragraph if you’re interested). Electric pressure cookers were also examined and found wanting, for a variety of reasons: smaller size (too small), the nonstick coating inside was less durable than the stainless steel in regular models, they lacked handles, they spun around when stirring, and weaker heating elements. The only model they half-heartedly recommended was Emeril by T-fal CY4000001 6-Quart Electric Pressure Cooker, Silver . If you’re interested, the article says that 5 recipes from Cook’s Illustrated’s new book, Pressure Cooker Magic (not out yet, I gather, since I can’t find it online anywhere), are available for free for 4 months (until May 13th, 2013). You will have to sign in/up (free) in order to access the recipes. There’s one for Asian-Style Boneless Beef Short Ribs, Chicken Broth, Easy Chicken and Rice, Easy Ziti with Sausage and Peppers, and Parmesan Risotto. I do have a number of recipes on my blog prepared in the pressure cooker. In case you’re interested, click on the links below. And I just posted 2 days ago an article about cooking beans – if you click on this link, you’ll go to that one, and do print out the 2-page chart which includes the cooking times for cooking every possible kind of bean in a pressure cooker. Posted in easy, pressure cooker, Veggies/sides, on January 25th, 2013. Do you have a pressure cooker? I don’t use mine enough, but when I do, I’m so delighted with the results. Usually parsnips take a good long time to cook. Not this way! It was last Sunday afternoon. I went to a concert at our church – to hear the Male Chorale from Cal Baptist (a college in Riverside, 40 miles or so east of where we live). What a performance it was, and I loved every minute of it. But when I got home it was later than I’d planned and I’d not done much preparation for dinner! My DH helped me some – he prepped the Brussels Sprouts with Maple Syrup. I had made a new salad dressing (I’ll post it soon). I’d marinated some steaks and just needed to make the sauce to go on them, chop the salad and pan roast the Brussels sprouts. I’d also wanted to use the parsnips too, that were growing feathery roots in my vegetable bin. I did a quick search on the internet and found something immediately that sounded good. I had oranges from our trees and I had the pressure cooker all ready! First I peeled the parsnips, which took about a minute. I sliced them into smaller pieces, threw them in the pot, added a little bit of butter, zested the orange (and set that aside for later), then squeezed the juice. The recipe indicated some sugar, salt and that was it. They were pressure cooked for 5 minutes and I did a quick cool-down under the faucet and into a serving bowl they went with a sprinkle of Italian parsley and the orange zest. Delicious. It’s not really a “sauce,” like I think of sauce – to me sauce means something thickened – not a jus. This was just orange juice that permeated the parsnips like magic. It was very low calorie – 104 calories and 2 grams of fat per serving. What’s good: how easy and quick it was to make. I may try this same recipe with carrots. You could make it with no butter (the original didn’t have any added fat), but I did use a little bit. Altogether delicious. My DH could hardly get enough of them. What’s not: nothing! Just be careful and don’t over cook them. 1. Place parsnips in pressure cooker. 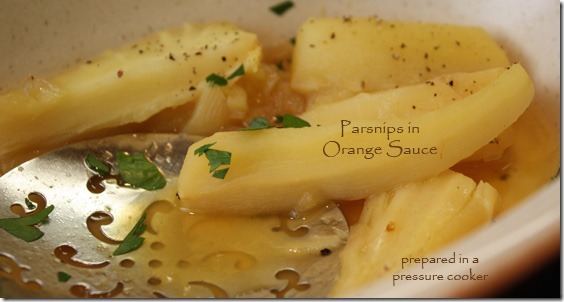 Combine orange juice, sugar, butter and salt; pour over parsnips. 2. Close pressure cooker cover securely and cook for 5 minutes only. Do not over cook. Run cold water over top of pressure cooker to reduce pressure quickly. Sprinkle parsnips with orange zest, Italian parsley and serve. Per Serving: 104 Calories; 2g Fat (14.4% calories from fat); 1g Protein; 22g Carbohydrate; 5g Dietary Fiber; 4mg Cholesterol; 143mg Sodium. Posted in easy, Pork, pressure cooker, on February 5th, 2012. 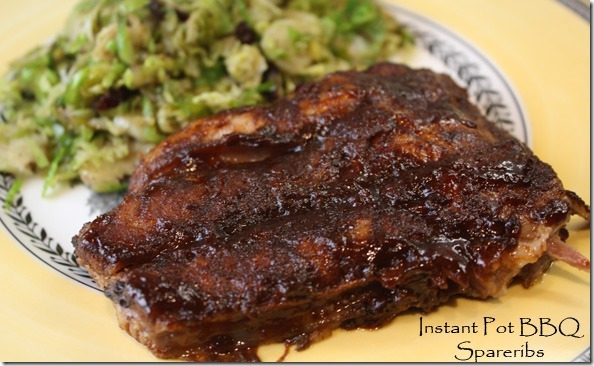 A super easy pressure cooker recipe for country ribs. Not only was it easy, but the flavor of the sauce was outstanding. You can see the little pieces of onion in the sauce. Going to the freezer, I grabbed a small package of the Berkshire pork we purchased last summer. I’m embarrassed to say that this is the first of it I’ve used (we bought a quarter of a 4-H Berkshire pig). My freezer has been just overflowing. I’ve not purchased any fresh meat for months (except for additional chicken which we eat often), in an attempt to use up some of the good stuff we have in the freezer. But with just two of us eating, it takes awhile to make much of a hole in the jam-packed freezer contents. In addition, I didn’t even think about how I’d prepare it. So I went to Eat Your Books, searched for “country ribs” and it told me in the short form what ingredients are in each recipe. Choosing one, yup, I had all that was needed. I can’t say that I have ever done country ribs in a pressure cooker. What a winner of a recipe this is. 25 minutes in the pressure cooker and it was done! Wow. Ordinarily I would have simmered the ribs for awhile in water, then we would have grilled them on the barbecue. Not needed with this recipe. It came from Pressure Cooking for Everyone by Richard Rodgers. First the ribs were browned in oil in the pressure cooker pot. That was easy and took just a few minutes. The ribs were removed, then I lightly sautéed an onion, with a bit of garlic added in at the end. Catsup was added, some jalapeno jelly (or you could use apricot preserves instead), chili powder and some water to give it just enough saucy consistency. The ribs were added back in, on went the lid and I brought the pressure cooker up to steam and it cooked for 25 minutes. I brought the heat down right away by putting the pressure cooker under the cold water faucet in the sink. Done. While it had been hissing away I made a green salad and some cauliflower. The pressure cooker pan did have a bit of grease in it, so I spooned that out, then scooped out the remaining barbecue sauce onto the cooked ribs. Oh, it was fantastic. This recipe was so easy – I’d make it again any day. And I just loved the flavor of the sauce. What I liked: the flavor of the sauce was just right as far as sweet scale. Because the onions are chopped, they don’t disintegrate, and I liked that little bit of texture in the sauce too. Easy to make too. I loved how quickly it cooked too. Just what a pressure cooker is for! 1. In a 5-7 quart pressure cooker, heat the oil over medium-high heat. In batches, add the ribs and brown lightly, about 5-7 minutes total for each batch. Transfer ribs to a plate, season with salt and pepper and set aside. 2. Pour out all but a tablespoon of the fat in the pan and return to the heat. Add onion and cook until softened, about 2-3 minutes. Add garlic during last minute of cooking. 3. Stir in the catsup, jalapeno jelly, chili powder and water and stir. Add the ribs back into the pan. Cover and lock lid in place. Follow directions for your pressure cooker, but bring it up to pressure and cook for 25 minutes. Remove from heat and quick-release the pressure [I put it under a stream of cold water in the kitchen sink]. Open the lid, tilting it away from you to block any escaping steam. 4. If desired, you may heat the sauce on the stove top and boil it down to a desired thicker consistency. Or, spoon out any pools of fat and scoop the sauce on the top of all the ribs and serve. Per Serving: 770 Calories; 47g Fat (54.7% calories from fat); 41g Protein; 47g Carbohydrate; 2g Dietary Fiber; 160mg Cholesterol; 1141mg Sodium. Posted in Pork, pressure cooker, on April 24th, 2011. The latest issue of Food and Wine magazine had a quick (and easy) method of making carnitas (pork) tacos. Two of our grandchildren were visiting the past week, and I know they enjoy Mexican food, so this seemed like an easy entrée. I served it with a green salad, and that was dinner. The pork shoulder roast should be trimmed of noticeable fat, cut into small chunks, and it’s pressure-cooker cooked for 25 minutes. Do run the pressure at a low level if possible. Also, don’t put much water in the pan – it makes some fluid (water and fat) as it cooks, but after the meat is cooked, you mix the limited amount of fluid with the three spice powders (ancho, chipotle and achiote) to make a kind of sauce on the meat at the end. The meat chunks are drained, then briefly fried in a bit of vegetable oil – to caramelize the outside edges a little. Then you just pile some pieces onto a hot corn tortilla, add some cilantro, a squirt of lime juice and some sliced avocado. If you desire, put out some shredded cabbage, and cheese and let people help themselves. Result? Well, this isn’t quite as flavorful as a many-hour roasted carnitas roast, but for a quick weeknight dinner this was just fine. Flavor was good and it made for an easy cooking experience. 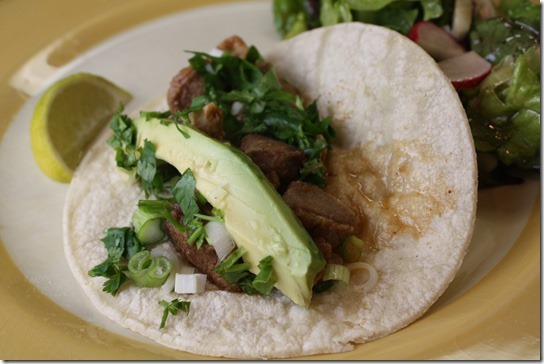 I do have another recipe on my blog for a caramelized pork carnitas also. That recipe requires a bit more cooking time than this one, but it has some added steps too. Both are good, but if time isn’t a problem, I’d opt for the caramelized one which also has a bunch of cheese added to it as well. I adapted the magazine recipe a little (I used more pork and I’m glad I did because we barely had enough for 5 people), so the recipe below has been changed with my additions and changes. NOTES: You want very little fluid in the bottom of the pressure cooker when you add the spices. Start with less than 1/4 cup, add the spices, then add more of the broth as needed to make a sauce. The nutrition info does not include calories for the tortillas, cilantro and avocado. It’s important that you don’t allow the pressure cooker to steam too much – you want it to be under very low pressure. Some cookers are adjustable for 15-25 psi. Use lower setting if possible. 1. Pour 1/4 inch of water into a pressure cooker and add the pork. Cover and cook at 15 PSI for 25 minutes, regulating the heat to prevent excessive steam from escaping through the valve. Turn off the heat and wait for the pressure cooker to depressurize so that the lid can be removed without force, about 10 minutes. Using a slotted spoon, transfer the meat to a strainer. Stir the achiote paste and both chile powders into the pan juices and season with salt. 2. In a medium skillet, heat 1/2 inch of oil until shimmering. Working in batches, fry the pork over high heat, turning once, until crispy, 3 minutes. Season with salt. Add the meat to the sauce and stir to coat. Serve the carnitas with tortillas, sliced avocado, cilantro and lime wedges. Makes about 10 tacos. Per Serving: 533 Calories; 42g Fat (72.3% calories from fat); 35g Protein; 1g Carbohydrate; trace Dietary Fiber; 145mg Cholesterol; 167mg Sodium. Posted in Beef, easy, pressure cooker, on February 1st, 2011. 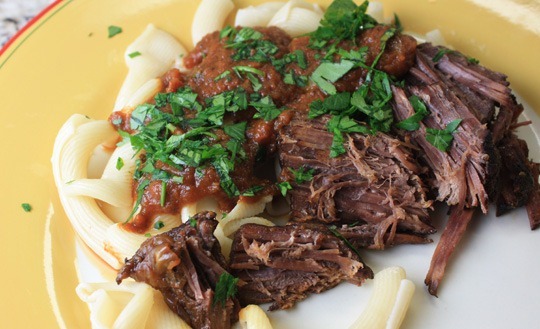 That’s sliced pot roast in the foreground, laid partly on pasta, and the sort-of red sauce that got whizzed up in the food processor after cooking the meat in the pressure cooker. I’m on a kitchen mission. A mission to work more diligently to clean out my freezer. I not only have a huge full freezer in my kitchen, but I have a second lower-drawer freezer in the refrigerator/freezer in our garage. That latter freezer holds mostly meat. And it holds a LOT. Enough that, were we to have a catastrophe of major proportions, I think we could live (with a generator, mind you, keeping the meat frozen) for at least 3 months without buying any meat. At a guess, 3 months. Veggies – well that’s a different matter. I have some canned stuff and a few frozen bags, but mostly my freezer is full of meat products, at least 5 pounds of different kinds of nuts, a few oddball things like frozen limeade, squeezed lemon juice from our Meyer lemon trees, chutneys of a few varieties, and some ordinary things like chili, soup (lots), bread, bacon, sausage that we have for breakfast most days, a few cookies, one dessert I made a couple of weeks ago, and some chipotle chiles. My DH, darling that he is, often tells people how much meat we have in our reserve freezer, and that all he must buy is a Coleman stove and we’d be in business. We could set up a local soup kitchen. But we’d need that stove first, which we haven’t purchased. We should. All part of earthquake or emergency preparedness. We don’t have a generator, either. So, the next best thing is to start eating up the meat. Therefore, I defrosted a 3-pound chunk of boneless chuck roast a few days ago. It was nicely sealed up in plastic (I have one of those FoodSaver things that seals foods of all kinds so they don’t get freezer burn). My guess is that there are other people out there like me – who really know how to pack a freezer. Right? We’re almost to the point that our kitchen freezer door must be opened carefully – like Fibber McGee’s closet, for fear something will fall out and break your toe. Most of you readers are too young to remember Fibber McGee and Molly, a long-running radio program (1935 – 1959), where one of the long-standing jokes was about somebody inadvertently opening the hall closet to a long, noisy crash of stuff. I vaguely remember the program because my parents loved the show. Once we got a television (about 1946, when I was 5) we didn’t listen to much radio anymore. But the joke about the closet lives on and it always ended with Fibber’s comment: I’ve gotta clean out that closet one of these days. My freezer, therefore, is my Fibber McGee’s closet! The last few days I’ve been more than a bit under the weather. But I’d defrosted this roast before I got my cough/cold thing I have, so on day 3 of my cold I dug out my Fagor Duo Stainless-Steel 6-Quart Pressure Cooker and fired it up. Referring to a recipe in one of my 3 pressure cooker cookbooks, I settled on an Italian style roast because I knew my DH would enjoy having just a little bit of pasta on the side. We don’t eat much pasta because Dave’s a diabetic, but once in awhile we celebrate and always savor every bite! The pot roast took about 20 minutes of prep (browning the meat, cutting up all the veggies and cooking them briefly), and about 1 1/4 hours to cook it all under pressure. Then I removed the meat and tented it with foil while I prepared the sauce. All of the stuff left in the pan, the veggies (except the fat I was able to spoon off the top) went into my food processor and I whizzed it up to a smooth puree. I tasted it for seasonings, then poured it out over the sliced beef and the pasta. With a green salad, that was a complete dinner. Bottom line: it was good. Certainly not as good as my tried-and-true French Pot Roast a la Mode that I’ve used for years. That takes innumerable hours to make and bake. But since I was in sort of a hurry, it was very good. My DH loved it – really loved it. And it was on the table in about 2 hours. 1. In a large pressure cooker (5-7 quart), heat one tablespoon of oil over medium-high heat. Dry the roast briefly with paper towels and add to the hot pan. Saute until one side is dark brown, turn over and repeat on second side, about 5 minutes. Transfer meat to a plate and season the meat with salt and pepper. 2. If there is fat in the pan you may pour it off, then add the other tablespoon of oil. Add the onion, carrots, and celery. Saute for a few minutes until the vegetables are nearly limp. Add the garlic and stir, cooking for another minute. Add the red wine, seasonings, and bring to a boil, scraping up the browned bits on the bottom of the pan, using a wooden spoon. Add the chopped tomatoes and their juice. Stir. 3. Return the meat on top of the vegetables, adding any juices from the plate. Lock the pressure cooker lid in place and bring to high pressure. Reduce heat (using directions for your own pressure cooker) but maintain a steady steam and cook for 1 1/4 hours. Remove from heat and cool, using directions with your unit. Open lid and transfer the meat to a platter and cover lightly with foil. 4. Pour all of the veggie mixture into a food processor and blend until the mixture is pureed. Return to the pressure cooker pan and reheat. Taste for seasonings. 5. Meanwhile, prepare your choice of carbohydrate (1) pasta; (2) mashed potatoes; or (3) rice. Slice the meat across the grain and place beside and partly on top of the carb and pour the sauce over the top. Garnish with Italian parsley. Per Serving (this assumes you consume all the sauce and fat – you may not): 802 Calories; 47g Fat (53.9% calories from fat); 49g Protein; 41g Carbohydrate; 4g Dietary Fiber; 153mg Cholesterol; 554mg Sodium. Posted in pressure cooker, Veggies/sides, on May 6th, 2009. When I bought my Fagor pressure cooker, I recall watching a video (on a DVD included in the package) and one of the recipes was for risotto. Really, I thought? 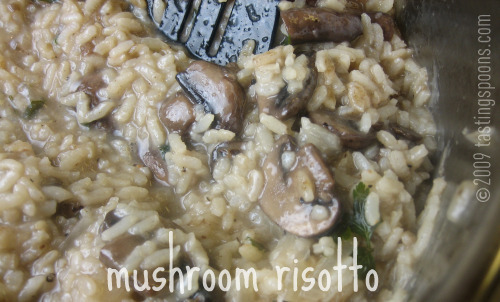 You can make risotto in a pressure cooker? Well, I’m here to tell you this recipe worked like a charm. I rarely make risotto, for two reasons: (a) rice is a high glycemic carb; and (b) it’s labor intensive. But, as you probably know, risotto is also downright delicious. It’s probably been 2 years since I’ve made risotto, but I think I might make it slightly more often with this new recipe. We had a nice thick ribeye steak for dinner, a green salad, an artichoke, and this risotto. 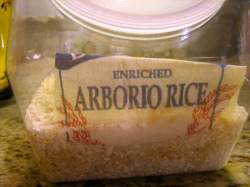 Arborio rice always lives in my cupboard, even though I rarely use it. I had some already-prepared mushrooms (leftovers) so I decided to add them to the mixture. I wasn’t sure the mushrooms would withstand the pressure cooker method, so I added them in at the end (along with the garlic and parsley and Parmesan cheese). First you saute the onion, then add the rice and cook it briefly in olive oil. You add the white wine and let it evaporate, then broth is added and you let it do its pressure cooker thing. Mine pressured for five minutes. Once I removed the lid there was just the perfect amount of liquid in the pan, but once I added the mushrooms, it thickened up some, so I did end up adding a bit of water. Taste the rice to see if it’s cooked perfectly – still slightly firm to the tooth. You do not want to overcook it, that’s all. You may need to try your pressure cooker. The creaminess was perfect. And it was really tasty. Next time I might add a bit more Parmesan. If you’re eating this as your entree, it’ll serve 2. As a side, it’ll serve at least 4, maybe 5. 1. In pressure cooker pan, heat the olive oil and gently fry the onion until soft and translucent. 2. Add rice and saute for about 1-2 minutes until the rice glistens but does not brown. Add the white wine and cook until the liquid has evaporated. Add the broth, stir, then follow directions for your pressure cooker. Cook under pressure for about 5 minutes (or a maximum of 6 minutes). 3. Meanwhile, in a small nonstick skillet heat the oil and saute the mushrooms briefly, then add garlic. Continue to cook for about 2-3 minutes until the mushrooms are just cooked through. Add the parsley and set aside. 4. Cool the pressure cooker under cold tap water until the steam is released. Open the pressure cooker, place it back on the stove. If there is too much liquid, cook for a minute or two. Stir in the butter, parmesan and black pepper. Add the mushrooms and stir in to the risotto. If the rice is too dry, add a bit of hot water. If it’s too moist, continue to cook over low to medium heat until some of the liquid has evaporated. 5. Replace the lid on the pressure cooker (don’t cook it, you’re just trying to keep it hot) and allow to rest for 2-3 minutes. Serve immediately. Per Serving: 394 Calories; 21g Fat (52.2% calories from fat); 9g Protein; 34g Carbohydrate; 1g Dietary Fiber; 25mg Cholesterol; 627mg Sodium. Posted in pressure cooker, Utensils, on July 10th, 2008. 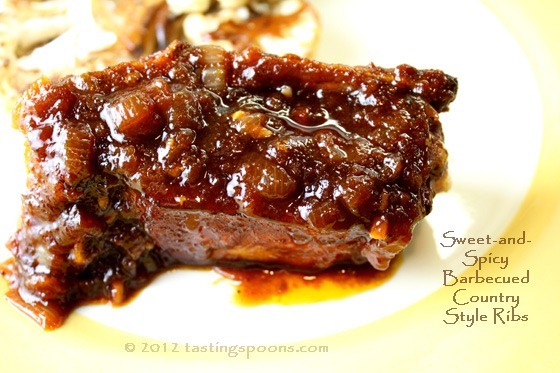 Some months ago I attended a cooking class where the chef prepared barbecued short ribs in a pressure cooker. The cooking school didn’t have one for her to use, so she brought her own. The owner of the cooking school recommended the Fagor brand (made in Spain) Duo. And she offhandedly said – you’ve gotta try carrots in the pressure cooker. Really, I thought? Carrots? I haven’t had a pressure cooker for years. The one I was given in 1962 long ago bit the dust. Since I’m retired, I argued to myself that I really didn’t need one. 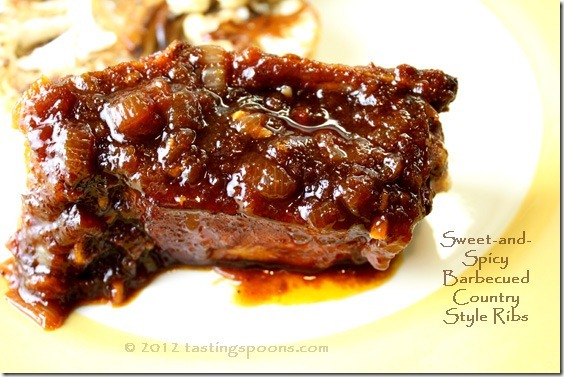 Until I tasted the results of that recipe (the short ribs) I had kept that interest at bay. Then, my friend Cherrie loaned me her Fagor P.C. for a few weeks. I made three dishes in it and decided I wanted one. 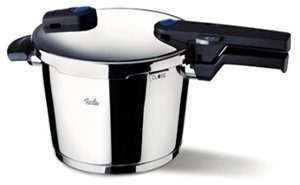 I bought mine on eBay – it was a Fagor Duo combi set – it comes with two base pots (a 4-quart and an 8-quart), one pressure cooker lid, a steamer insert, and a glass lid. The one I acquired was NIB (in eBay language that’s New-In-Box). Did I get a bargain? Well, after shipping I saved about $20, I think. I do not have an eBay addiction – in fact I’m not very good at keeping on top of the bid process on the few occasions when I’ve tried to buy something that way. I bought mine as a Buy Now, which bypasses the whole bid thing. Likely my set came from a Fagor outlet store as I discovered a black mark inside the lid. It won’t come off. But who cares? My next project is to decide which cookbook(s) to buy. Nothing came with the pressure cookers except a tiny minimally informative booklet and a DVD. I did watch the video, though, which helped explain the procedures. I’ve got that down pat. I went to the web, then, and researched the books. I think I must have two, so am going to add them to my amazon.com wish list (my birthday is coming up). In the interim, though, I went to the internet to find recipes online. There’s one definitive site – Miss Vickie’s – with lots and lots of recipes. 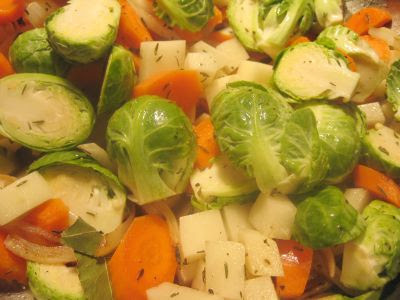 I chose one for mixed vegetables (Brussels sprouts, one small potato, onion and several carrots). I sautéed the onions first, then piled into the pot the fresh chopped vegetables (with the potatoes and carrots cut smaller than the Brussels sprouts – otherwise they won’t get done at the same time). I added some chicken broth and a bit of butter, plus some thyme, salt and pepper and it was done. Took 4 minutes. FOUR MINUTES! Meantime I had sautéed some orange roughy, and my dinner was completed. All within about 15 minutes. Love it! And the vegetables? I thought they were terrific. And would you believe the best part was the carrots!